The untold story of a heroic band of Caribbean pirates whose defiance of imperial rule inspired revolt in colonial outposts across the world. In the early eighteenth century, the Pirate Republic was home to some of the great pirate captains, including Blackbeard, “Black Sam” Bellamy, and Charles Vane. Along with their fellow pirates—former sailors, indentured servants, and runaway slaves—this “Flying Gang” established a crude but distinctive democracy in the Bahamas, carving out their own zone of freedom in which servants were free, blacks could be equal citizens, and leaders were chosen or deposed by a vote. They cut off trade routes, sacked slave ships, and severed Europe from its New World empires, and for a brief, glorious period the Republic was a success. I love pirate stories. I can say that I really enjoy watching The Pirates of the Caribbean. Of course, I know that those movies were inaccurate, but I still like them. Because of this book I know now a lot of what is wrong, which is a lot. Unfortunately though, this book is a little dry. But then again it is bursting with facts about pirates and history about not only Britain, but also France, America, Africa, and so many other countries. It also talks a lot about about different pirates and the monarchy of countries. 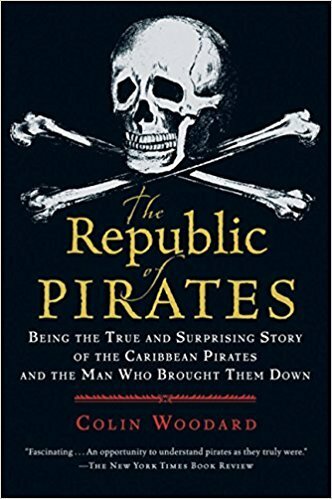 If you are at all interested in understanding the history of pirates, The Republic of Pirates is an interesting read. Just expect it to take some time to read.